President Trump’s declaration of a national emergency on the U.S.-Mexico border came as an unprecedented move, though not entirely unexpected. The announcement came following a two month long dispute between the president and Democrats over funding for the former’s proposed border wall – a dispute involving a record-breaking 35 day government shutdown that left thousands of government workers furloughed. Though the shutdown temporarily ended on January 25 with the passing of a short term spending bill, its ultimate conclusion came in the form of a bipartisan spending bill that offered concessions from both Democrats and Republicans. Trump’s announcement followed his signing of the bill into law on February 15. Trump has explained his declaration as necessary in order to prevent the influx of illegal immigrants and crime from Mexico, though his decision is believed largely to be motivated by his inability to push his border wall spending bill during his months-long dispute with Democrats. Trump has repeatedly demanded a $5.7 billion budget for his wall – a number that was eschewed by both parties in Congress in favor of just $1.375 billion for additional border fencing. 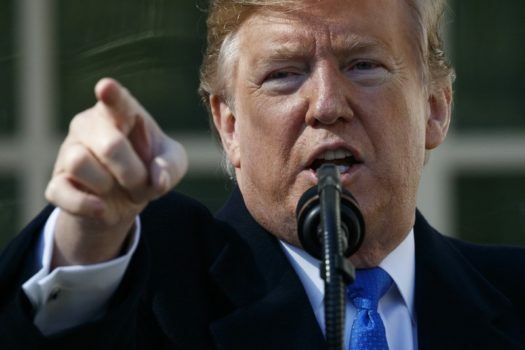 Declaring a state of national emergency allows him to redirect funding from other governmental endeavors, giving him approximately $8 billion total to spend on the border wall. Trump’s decision has been met with wide backlash from politicians on both sides of the aisle; conservative George T. Conway, husband of Kellyanne Conway, has criticized his declaration as unconstitutional, while House Speaker Nancy Pelosi, a Democrat, has similarly accused Trump of overstepping his legal boundaries. The most prominent examples of this backlash, however, may come in the form of the numerous lawsuits filed by states across the U.S. 16 states, including California and New York, have sued Trump on constitutional grounds, with the Attorney General of California in particular accusing the president of creating a “manufactured crisis.” These states include also Colorado, Connecticut, Delaware, Hawaii, Illinois, Maine, Michigan, Minnesota, Nevada, New Jersey, New Mexico, Oregon, and Virginia – all which have Democratic attorney generals. These lawsuits are unlikely to end the growing tensions between Trump and Democrats over the wider border wall dispute, which will likely not be limited to this standoff over a singular budget demand. Trump’s border wall, in the wake of numerous other failures, has become the face of his administration for many of his waning supporters, and a victory in this department would serve as the largest success for his presidency to date. For Trump, losing the battle for his border wall would mean losing one of the few opportunities for success in his tenure as president. A resolution to this battle will not come from the president. On the Democratic side, lawmakers have been doing their best, in turn, to win this dispute: the House of Representatives will vote Tuesday on a resolution that will attempt to block Trump’s declaration of a national emergency. This resolution will likely pass through the House, considering the Democratic majority – yet just as with the lawsuits, this alone will not end the Trump-Democrats battle. This dispute will be ongoing. Trump’s declaration, as unprecedented as it is, is only a small part of it.